There is only one minor drawback that I have come across with this setup. If you want to receive email from multiple accounts on your phone, or the web interface, you will need to leave a computer on to receive the mail from the various accounts. This computer will bring the mail from the various accounts into the one location. You may be able to scam such features from your Exchange Administrator if you are very lucky. This is not an issue if you only access your mail from the one computer. This configuration works in both Microsoft Outlook 2003 and 2007, though it may work in other email clients. This article is written specifically for Microsoft Outlook 2007. 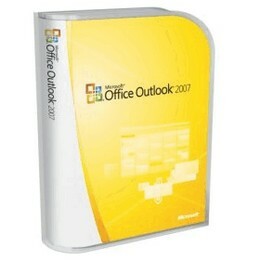 Setting this up between the two clients is slightly different, but it is very easy so I am sure you will be able to follow this if you are using Microsoft Outlook 2003. The first step is to make sure that your main account is an Exchange server account. This is the account/mailbox that all the other mail will be viewable from as we add them. The next step is to create your additional accounts. We will run through this quickly. Ideally, these additional accounts will be POP3, or HTTP protocols. It is not possible to access multiple Exchange accounts from the one Exchange account. To do that you will need to utilise the “Delegate” features. The final step is to ensure the new mail will go into your Exchange mailbox, rather than a new set of Personal Folders. It will probably do this by default. Here you can create a folder specifically for your new email account, or you can send the mail directly to the Inbox. If you want to send mail from multiple computers, and you decide to setup multiple accounts on each computer, you should decide which computer will act as the server. If you receive mail from POP3 accounts on multiple computers, you may find that you end up with multiple copies of the same email message. You can disable receiving mail from certain accounts, within Outlook. Open the Tools Menu > Send/Receive > Send/Receive Settings. You can then remove the accounts you don’t want to receive mail from out of the default send/receive group. When sending a new email message, you are able to select which account the mail is sent from. Simply write your email and click on the “Accounts” button. You will then be able to pick which account the message is sent from. It is very quick and simple. If you use this Exchange setup, it will work well for you when replying and forwarding email. The account that your email will be sent from, will default to the account you received the email on. You can easily change which account you send the message from by clicking on the “Accounts” button as shown above. You then see a simple pull down menu with all the available accounts which you can choose between. If you are not on the computer setup as above, you can create the accounts you want to send the mail from, or send mail from your Exchange account. If you are concerned about making your private email address public, consider one of the first options instead. If you want to keep your emails from the various accounts separate, you are able to create a folder for each account, and then use rules or the “Change Folder” option in “Account Settings”, to send mail as it is received into their corresponding folder. If you want your sent email to be split up according to the account they were sent from, create a folder within “Sent Items” for each account. You can then create a rules to filter your sent emails into each of these folders as each email is sent. I don’t bother with this step as it would force me to look in multiple folders to access my mail. If you do want to use separate folders for each account, it may be worth setting up your rules so that they send the messages into their folder only once the email has been read. It is possible to setup a different email signature for each account you send your mail from. 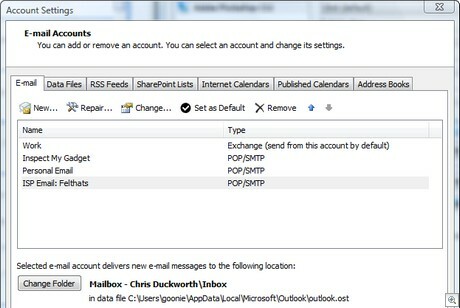 Once this is setup in Outlook, your signature will change automatically as you change your account. This works really well if you have both your work email and your personal email working together in the same Exchange account. Create a signature for each account, or however many signatures you want. Then select each account and associate it with a signature. Once you click “OK”, your signatures will follow you around as if you were using multiple email clients. Outlook was designed for this functionality. There is nothing magical about this configuration, we are just making the most out of Exchange and Outlook. I hope you have enjoyed this article and found it useful. Please stick around and check out some other articles at Inspect My Gadget. How-to: Customise your incoming alert sound for each email. thanks a lot for the tutorial. although it was eventually really simple to configure outlook for all my mail accounts it was still helpful and gave good guidance along the way, thanks! I changed to Outlook from Outlook Express, I put in the three email accounts I have but even through accounts are set up exactly as on Outlook Express, I never receive email on two of these accounts. Can you explain why I am not receiving my mail through Outlook? I am not familiar with Express. If it is anything like Outlook though, check out the send receive options. There are tick boxes to include various addresses in the send receive. IT is also worth testing the connection to find out if the account settings are a a problem, or outlook itself. Hi Brittney, unfortunately I don’t think there is a way. Some mail server types allow for it, but POP3 is out of your control once the server has received it. Follow up with an apology? Great how-to, thanks for that! I have a situation where we are only allowed a very limited space on the server and thus do not want my personal emails (sent, draft, trash, etc) stored there. I have set up my 2 main personal accounts in Outlook and gave them a folder on my Data Drive, unfortunately my Sent mail from these accounts still goes to my work Exchange Sent folder. You mentioned this but I was hoping you could go into more detail on how to do this. I really only want one Inbox and Sent folder for all of my Personal emails to reside regardless of which email address they were sent to or sent from. Thank you for any guidance you can give me. Greg, good question. This is a bit tricky. I don’t think there would be a way to make this happen without the mail touching the exchange server, without using a seperate email account. To cut down on storage on the server, you can create rules to move mail from one folder to another, but at some stage, the mail will all go through the exchange server, it just wont be stored there. One way to do it is to get all messages of a certain size or higher, and move them. It will be a bit fiddly to make the rule work perfectly for you, but if you start from a blank rule, I am sure it will be possible. I use to have 2 emails accounts on 2 different profiles on outlook 2003 and I can’t do the samething on 2007. Is there a way to do it ? Hi Marcelo, the method is very similar for both 2003 and 2007, they just look a bit different. Running through this guide should get it working for you. Where is the problem occuring? Hiya, can you tell me how to access multiple generic email accounts and have the ability to the sent email saved into the generic accounts sent folder. We can use the send from function but that saves it into my personal account not into my generic account. Is there a work around for this on 2003? btw nice and easy doco to follow! Hi Leah, I have been pondering it overnight and I don’t have a good solution. The only thing that has come to mind is using activsync or wmdc to sync your emails, and then using rules in your email client to shuffle the messages around. While it won’t be instant, they will end up in the correct location by the end of the day. Otherwise, you are probably looking at editing the registry, but that can become complicated and damaging. I use 2007 Outlook (not echange) on my laptop and desktop computers. Each has a different E-mail address. My desktop is set up with both E-mails addresses and I can send mail with both E-mail address from this computer. But how do I switch between the two E-mail accounts to read all of my mail? I need to set up my laptop so I can read all of my mail when I am traveling. Once I learn to read and send mail on both accounts I will set up my laptop. Hi Boyd, is all of the mail from the two accounts going into the one personal folders? I am not sure why you aren’t seeing the mail from both accounts. In account settings, you can change where the mail goes to, such as your personal folder file. To view the same mail on both your laptop and desktop becomes a bit tricky without exchange. You would need to tick the tickbox saying leave mail on server. The problem with this is that you will need to delete messages from both computers, and they will both have different sent items. You might be best to find a program that syncs outlook data between computers (not sure of any), or it might be worth looking into gmail. You might be able to have that import data from both of your accounts and then view it within Outlook. Many pop email accounts can be setup as imap which has a two way connection with the server. It’s not always pretty, but it may solve your problems. Feel free to ask for more tips. I am a little confused by the question. Hi Tom, The best way to do this is to give each user their own login. This meakes outlook have its own settings for each user that logs in. Another option is to use a service like gmail, neomail etc, an online mail service would allow each user to log into a webpage to access their mail, irrelevant of which computer they log in to. The last thing I can think of is to have rules setup on the computer to make the mail received from one account go into one folder, and mail from another account into another folder. The privacy wouldn’t be very good between the two, but it is a workaround. We have multiple eamil domains with 2003. How do I set up a person to be able to send from all of the domains. We get an undeliverable message: You do not have permission to send to this recipient. For assistance, contact your system administrator. Hi Ann Marie, Have a look into delegates. You can give people author rights to send messages from various accounts. I am not sure how it would work across multiple domains. It’s a bit beyond my experience. I have home setup as the default account. I have signature I would like attached to my outgoing emails sent from my work account. When I open a new message and choose my work account I would think the siganture would pop up but it does not. without having to click on signatures and choosing my work signature, and without having to change my default email account. ( I tried that and the signature popped up and when I chose my home account to send from instead the signature was still there requiring me to delete it.) I am just looking for the easiest (fewest clicks) way to make this work. Hi Chris, In Outlook 2003 (assume others) go to Tools > Options > Mail format… towards the bottom of the screen you can select which signature you use for your accounts. You can have diferent signatures for each account. Once this is setup, it should be a no click solution. Does this work for you? I have my Outlook set up this way at work (ie multiple email accounts being picked up through 1 exchange account) and it works fine. My question is, my mobile phone is able to sync all my mail, including my subfolders that the other accounts are diverted to, but from my mobile phone I can only reply or send a new mail from the default exchange account. Is there any way on any type of mobile phone to “reply from” an account just like I do in Outlook? Thanks. Hi Mark, looking at my phone, I am able to setup multiple accounts from them and manually (never) receive mail to the new non exchange account. The exchange and pop accounts don’t appear to talk, as in I can’t reply from. If I go into the pop account, I can paste in the original email into a new message and send from the pop account. Basically, it’s a nasty workaround. I am using office 2007. When i start my outlook i am getting error message :The connection to the microsoft server is unavailable.Outlook must be online or connected to complete this action. When i click it prompts for microsoft server name and mailbox name. what should i write it over there. Prompt response would be really appreciated. I’m trying to setup two Outlook emails to be viewed on through one. Is that possible? I’ve seen it done with an Outlook and a gmail account or other accounts but not two Outlook accounts at once. how do i connect to gmail accounts to one server on outlook 2007, so that when i go to outlook and update the calendar they both get emails to their phone. Definitely more useful and clear than the Office website. Thanks for the post! I have to exchange account and i want check them in outlook 2007 at a same time but i couldnt find any rule to seperate my two sent items and all my send email go to first Email Account. Try to create a rule that says “Apply this rule after the message arrives, Sent to ‘type your email address’ move it to the folder”. That should split it up as you want. 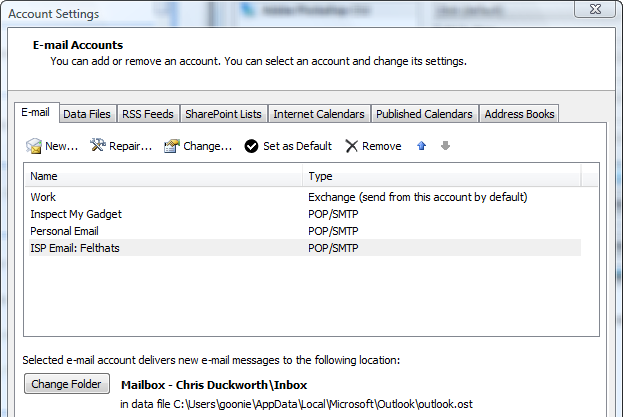 I have got multiple email accounts operating on a POP3 basis into Outlook 2007 which works fine. My query is that all my New Mail comes from my default account, HOWEVER when I reply to an email it defaults to another account. How can I set it that my New Mail & Replies come from the same account automatically and bypass me having to change it via the “Accounts” tab under the send button. I think you can set the default account in accoutn settings. That will be what comes up when sending a new message by default. I find that when I reply to emails, they are sent from the account the email was initially set to. I don’t think there is really an option beyond that. You just need to make sure each account you may receive through are setup as a seperate account. I have had this experience in 2003 and 2007. It may be exchange that makes this work better than pop, but I would have thought the software is more responsible for sending from the correct account. Hi, I have one exchange account and one POP account. I want to have separate inboxes. Currently all emails go to the exchange inbox and it is hard to distinguish what account the email was sent to. I set up a rule saying apply this rule after the message arrives through the POP account and on this computer only move to POP inbox folder. So now the new emails go to the POP inbox but there is still an email in the exchange inbox. How do I make it so only my exchange emails go to my exchange inbox and only my POP emails go to my POP inbox. I tried creating another inbox and making a rule that said apply this rule after the message arrives through the exchange account and on this computer only move to exchange inbox folder, but this still moves the pop email into the new exchange inbox. If you have any recommendations I’d appreciate it! Thanks. Also I’m using Outlook 2010.